I had been looking into the idea of External Hard drives for sometime, but hadn't bothered as I thought they would be expensive but unnecessary in the long run. After all, I have 80GB storage on my PC, so what, I thought, do I need with extra space. But in the day and age where we don't just use our PC as an office resource, but for entertainment, banking and to send and receive photos and videos, and we pay for things such a movie and music downloads, the idea of losing all our data is a bit of a nightmare, and a costly error at that. Freecom sent us one of their External Hard drives, which has an amazing 1 TB (or 931 GB ) of storage. Its very easy to use, you simply unpack, plug it in, plug the USB in to the PC and the rest is literally done for you. Plug and Play definitely applies here. Then, whatever file you need to have a copy of, be it a photo file, an album or any other important document, all that you're required to do is right click on the item, click to "Send To" and pick the Hard Drive from the list. That's it! It could not be simpler. And its super fast too, no sitting drumming the fingers waiting required. Its extremely quiet too, as it doesn't have a noisy fan inside, which also helps with its compact easy to carry and share design. Even better this is literally the smallest sized 3.5" External Hardrive you can buy- not just in the UK, but in the world! The size of storage is put into perspective when the tech savvy among you considers that your average film is a mere 600MB. So that's hundreds of films that you can save before you'd run out of space! 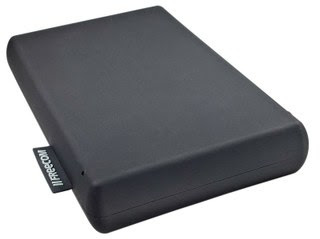 Priced at 149 pounds, its very reasonably priced too for such a large storage size compact USB hard drive. Freecom, we love it- no more heartache on opening a dodgy email and losing baby photos! And if you want to purchase a Freecom Hard Drive, or any of their great range, head to their website, and when prompted at the checkout, help yourself to a great 25% by typing in "FAMILY".